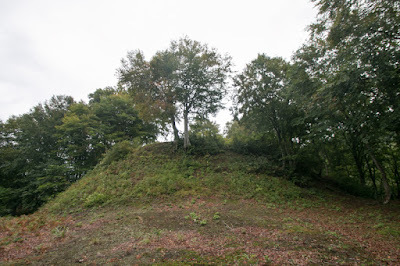 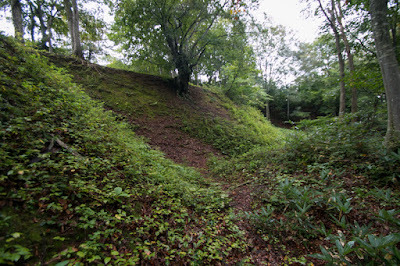 Arato castle (荒戸城) is located on a small triangle shaped hill just beside of Shibahara-Toge pass of old Mikuni-Kaido road, in the southern edge of Uonuma plain of current Niigata prefecture. 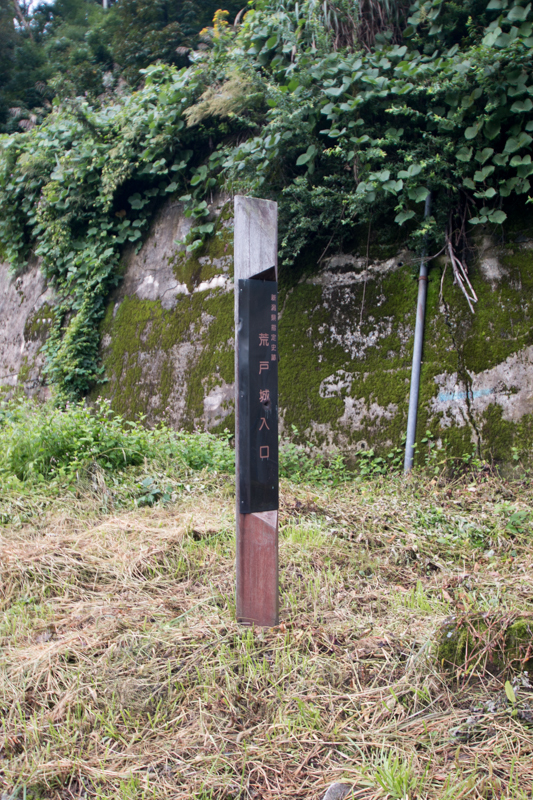 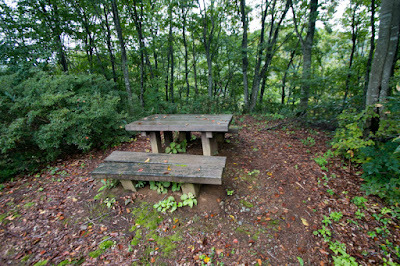 Mikuni-Kaido road is an important road which connects Kanto plain and Niigata area, and the roads goes down from Niigata plain along with Uonogawa river by the end of Uonuma plain passes Shibahara Toge pass then changes to the valley of Kiyotsugawa. 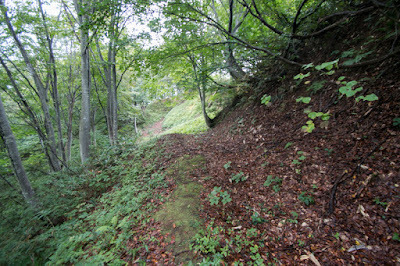 Ahead of Shibahara-Toge path the road climbs up the valley toward Mikuni-Toge pass, the border of Echigo province (Niigata prefecture) and Kozuke province (Gunma prefecture). Because of this geographic condition, castle site is a important control point of the road, especially preparing for invasion from outside. 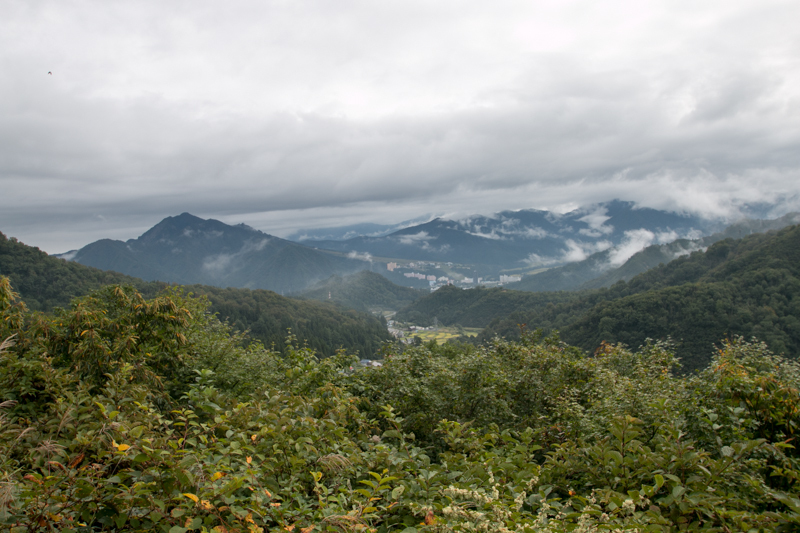 Utilizing heavy snow and access from Kanto region, today this area is developed as famous snow resorts such as Yuzawa ski slope or Naeba ski course. In the latter half of 16th century, Kenshin Uesugi (1530-1578), a famous warlord of Echigo province who was called as a "Dragon of Echigo", continuously fought with Hojo clan which was the lord of Sagami province (Kanagawa prefecture) who caught major part of Kanto region. 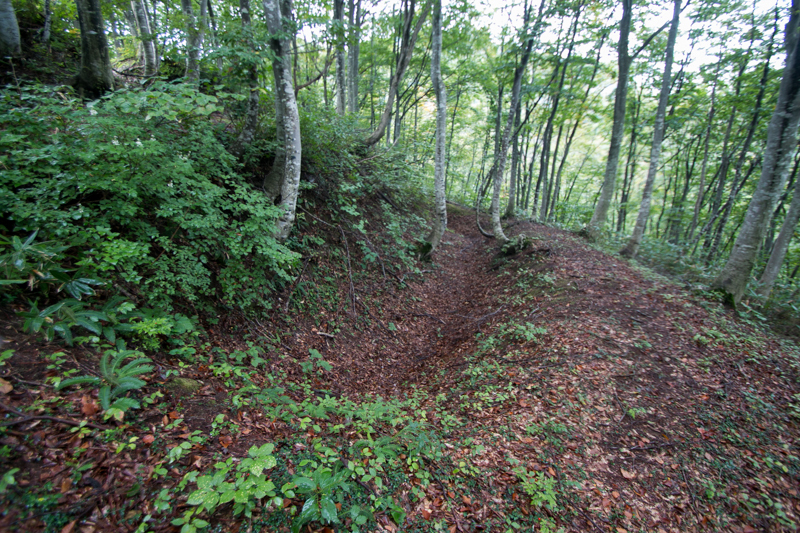 Kenshin was a genius of tactics praised as a god of war, and made over 10 time campaigns at Kanto plain across Mikuni-Toge pass over his life. 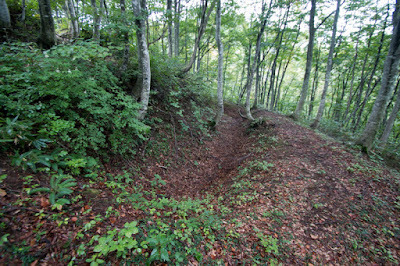 Since the time of Kenshin many castles were built along Mikuni-Kaido road, but around this time Uesugi army only fought ahead of the border then these castles, such as Asakai Yorii castle at current Naeba town, are mainly used as a lodge for march and did not have secure defense facility. 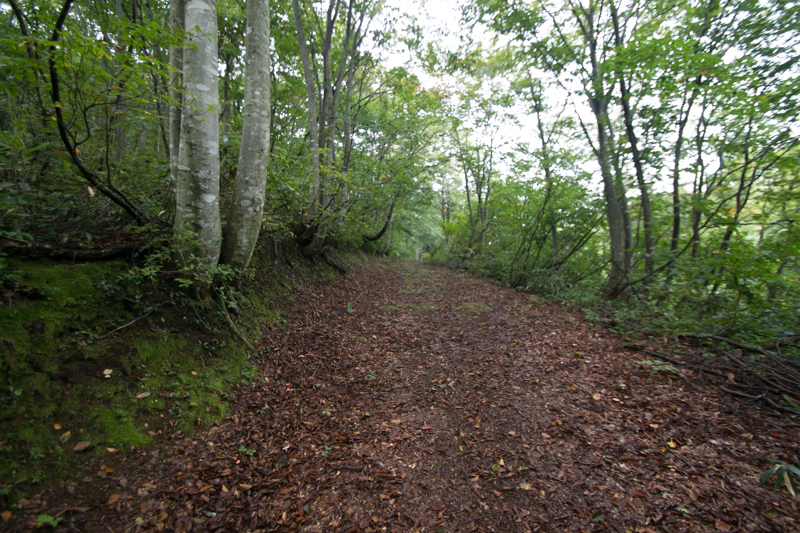 Although Hojo clan pushed up their front between Uesugi clan toward north, but at this point, Mikini Kaido road is only used for invasion from Echigo province, not from reverse side. 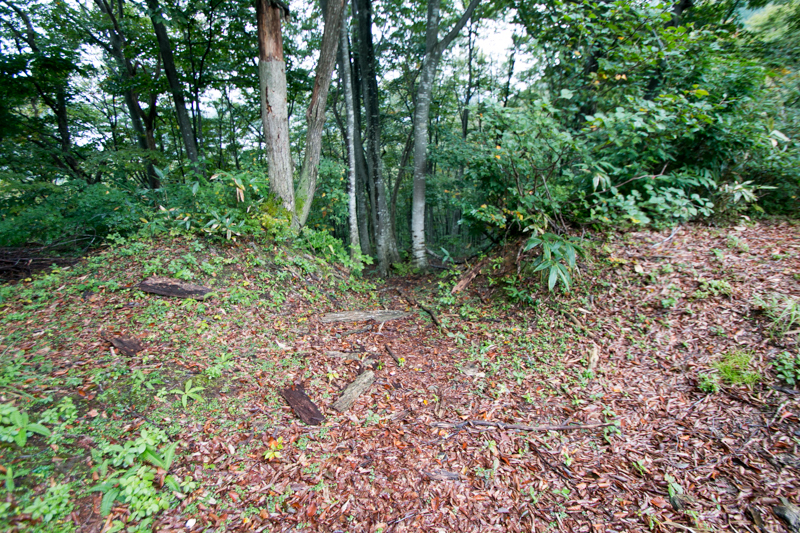 But the situation significantly changed after the death of Kenshin. 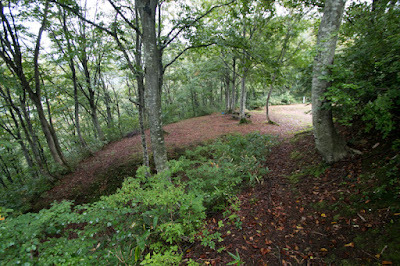 As Kenshin did not marry and have real son, he adopted two sons as a candidate of his successor. 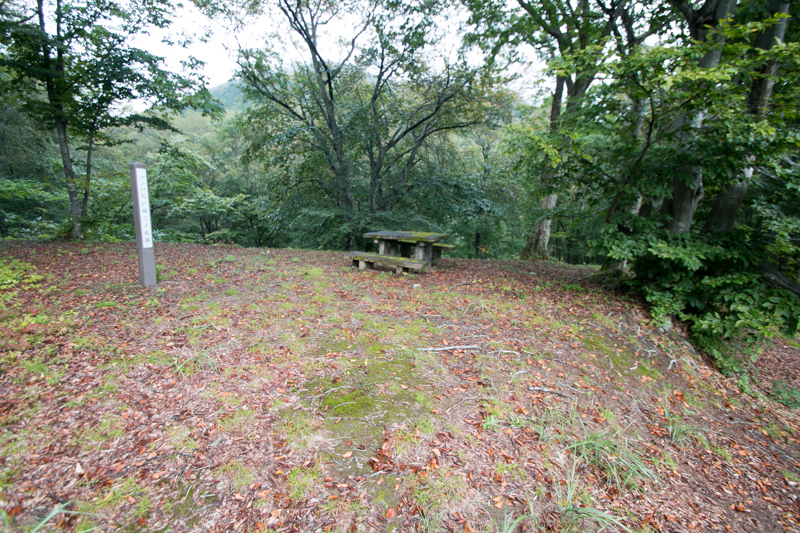 One of Kagekatsu Uesugi (1556-1623), the leader of Ueda-Nagao clan which was one of the major branch family of Nagao clan to which Kenshin also belongs. 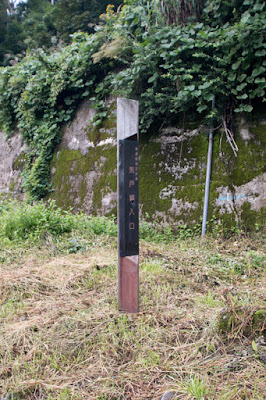 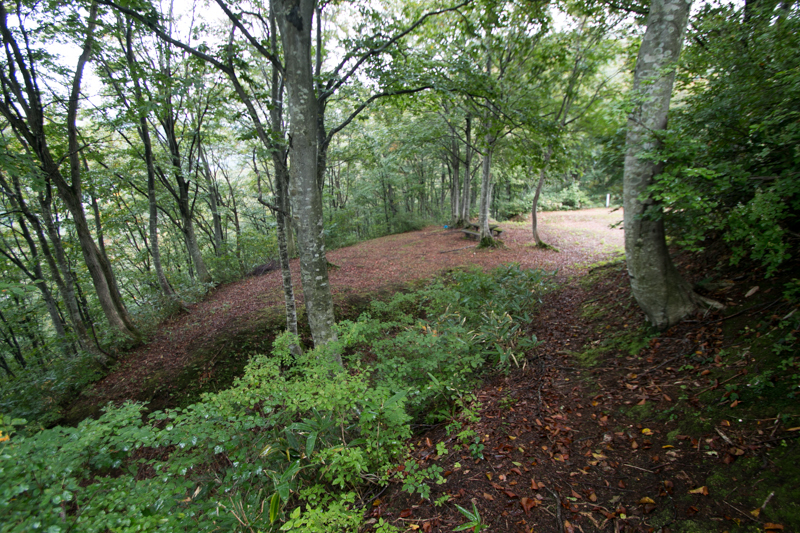 Ueda-Nagao clan was the lord of Uonuma area where Arato castle locates. 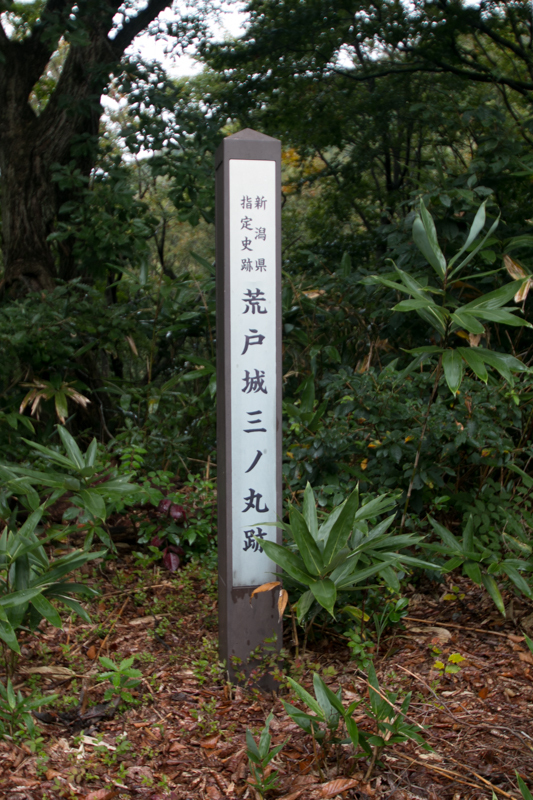 Another adopted son was Kagetora Uesugi (1552-1579), the seventh son of Ujiyasu Hojo (1515-1571), the leader of Hojo clan. 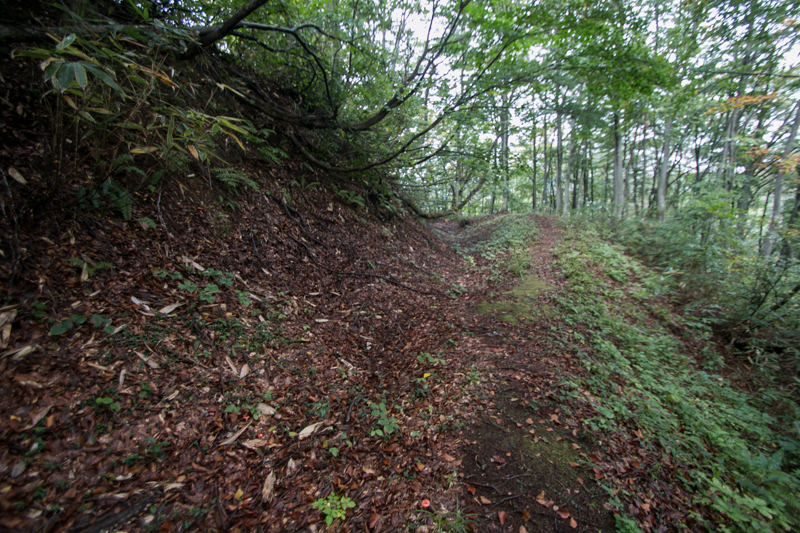 Although Uesugi clan and Hojo clan had been enemy, but around 1560's they temporally allied and Kagetora was sent as a hostage. 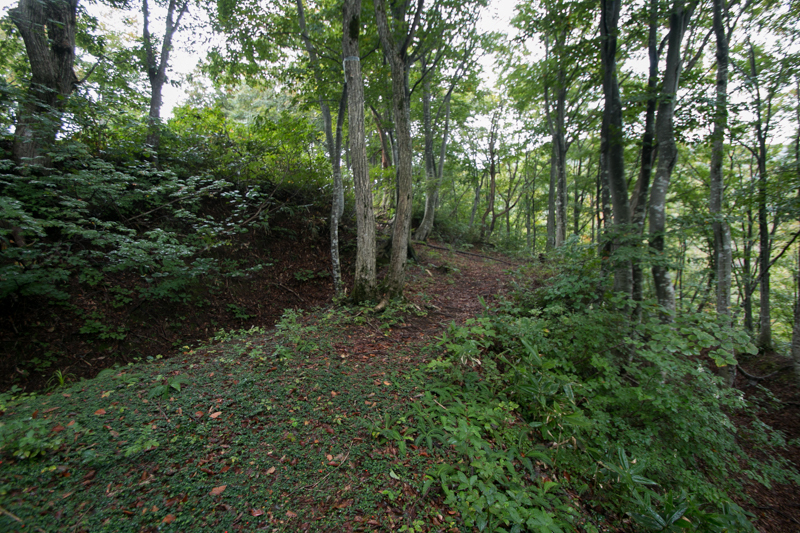 Soon Uesugi clan and Hojo clan broke again, but Kenshin did not kill Kagetora but rather adopted him. 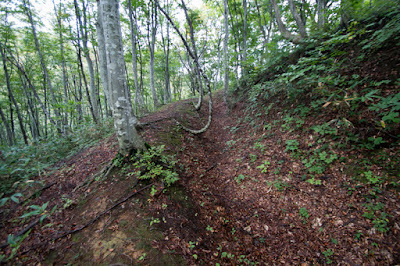 Precise intention of Kenshin is unknown, but existence of two adopted son was the cause of internal conflict. Furthermore Kenshin died without deciding his successor from these two adopted son. 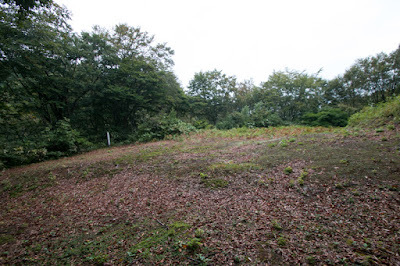 Because of this condition, just after the death of Kenshin in the spring of 1578, Kagekatsu and Kagetora formed supporters and started fierce internal conflict for successor, called as "Otete no Ran". 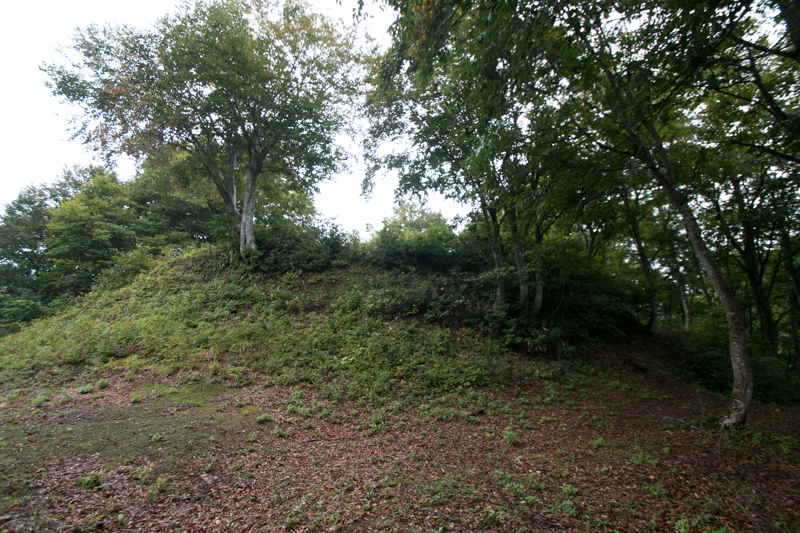 Kagekatsu was close to the guard of Kenshin and seized Kasugayama castle (Niigata prefecture), the main base of Uesugi clan and neighborhood. 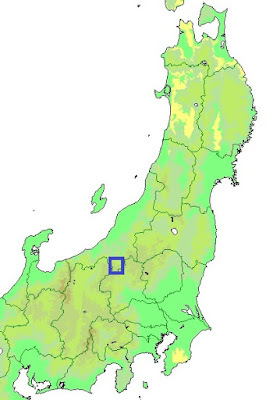 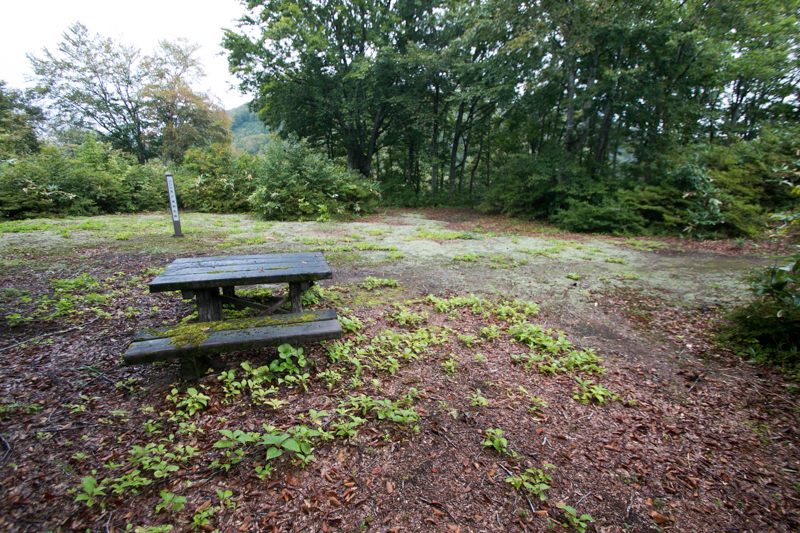 Of course Kagekatsu also held Uonuma plain where was the land of Ueda-Nagao clan. 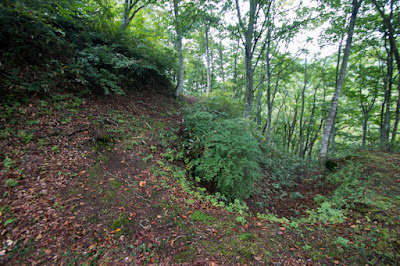 But local lords of middle part of the province who were at the middle of Kasugayama castle and Uonuma plain supported Kagetora, thus the army of Kagekatsu and Uonuma plain was totally separated. 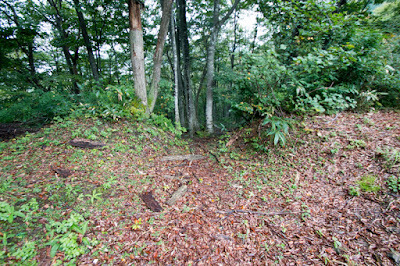 In addition to this, Hojo clan which was the native home of Kagetora is expected to send a large army to support Kagetora. At this time Hojo clan also allied with Katsuyori Takeda (1546-1582), the leader of Takeda clan and son of Shingen Takeda (1521-1573), a fatal rival of Kenshin Uesugi, and Hojo clan also asked Katsuyori to attack Kagekatsu from Shinano province (Nagano province). 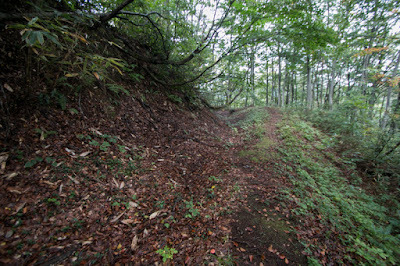 Under such circumstance, Kagekatsu side had to defend Uonuma plain from dominant Hojo army without assistance of main force of Kagekatsu. They built Arato castle as a final defense line at the entrance into Uonuma plain, but as a matter of fact, major part of their force was kept to protect their main base Sakado castle (Niigata prefecture) and it was impossible to place many soldiers to this castle. The structure of Arato castle is planned to make resistance against dominant Hojo army march Mikuni-Kaido road with quite limited soldiers. 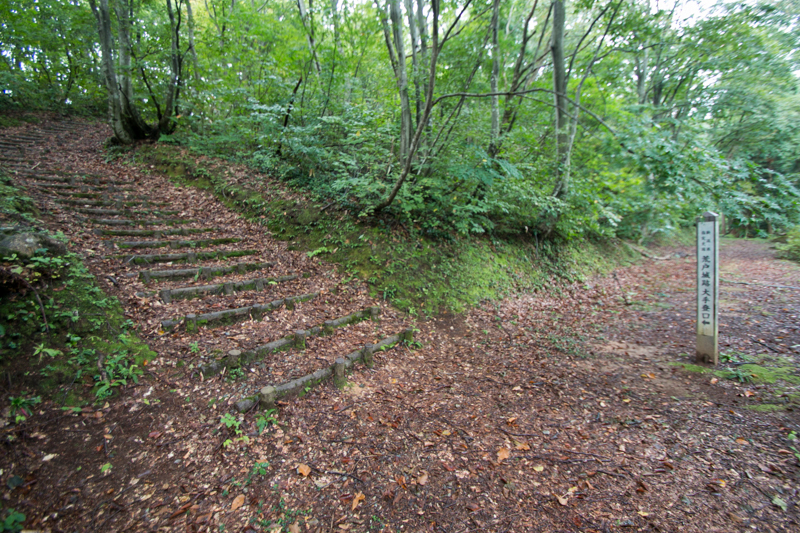 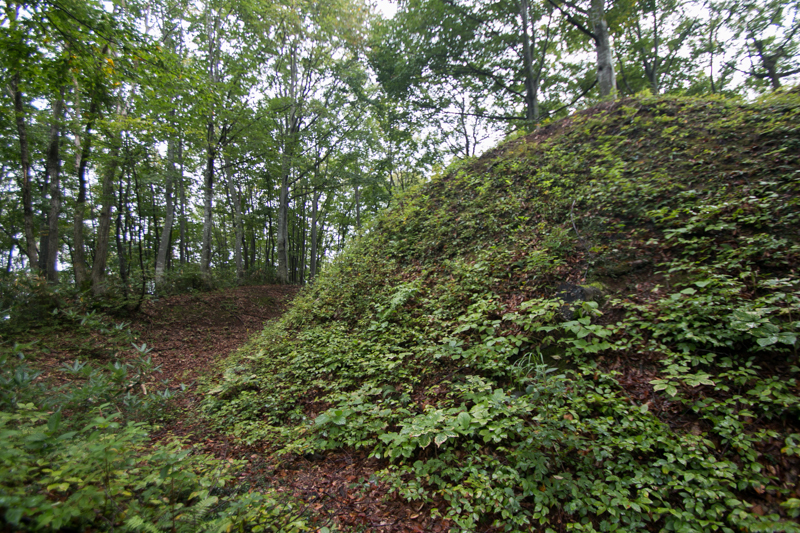 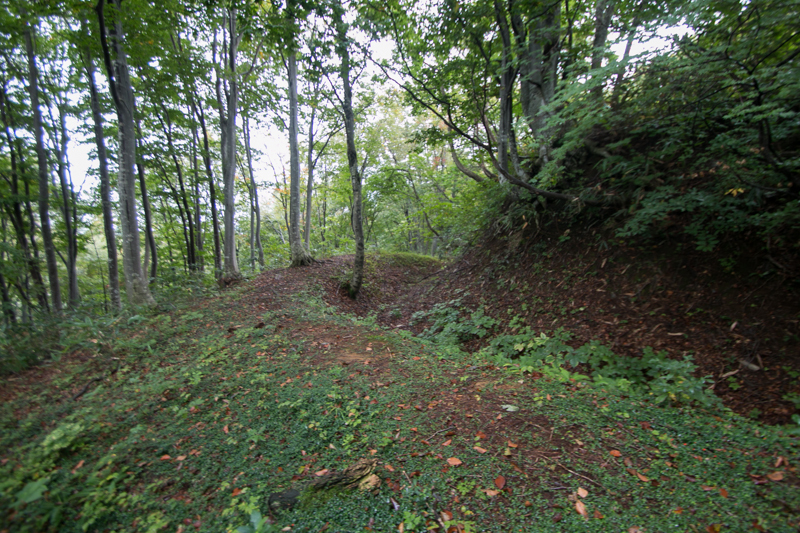 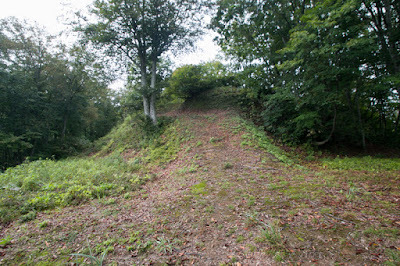 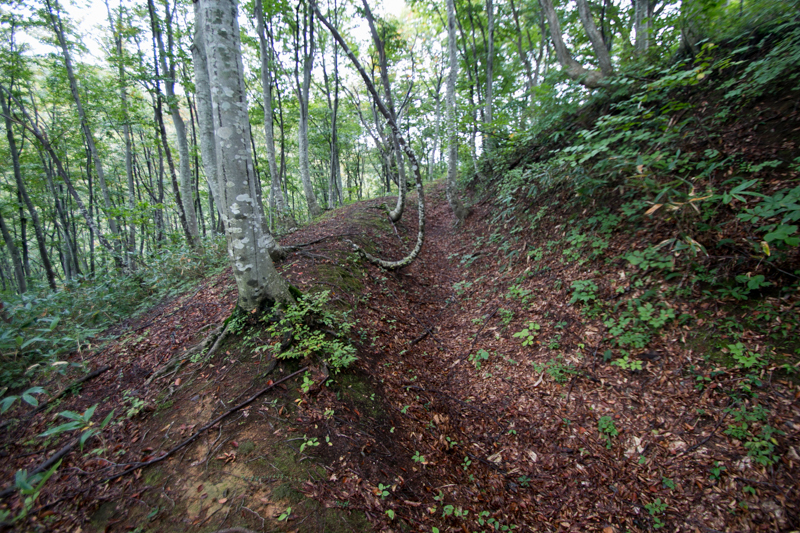 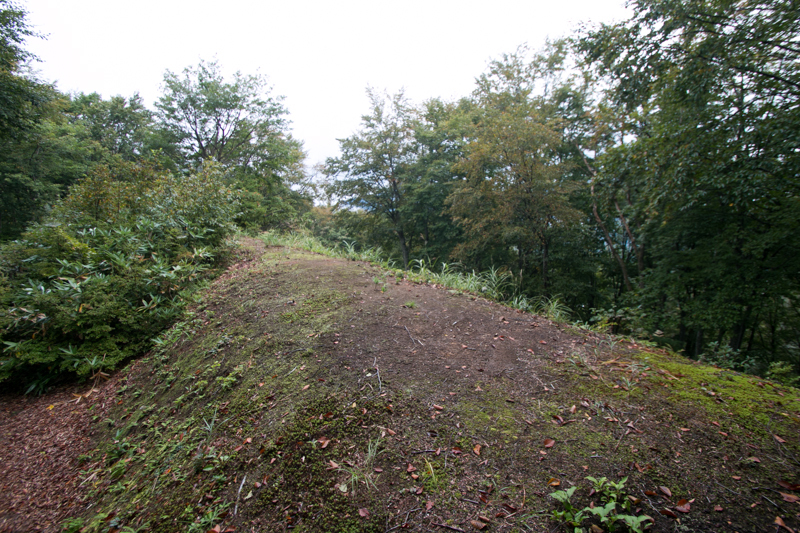 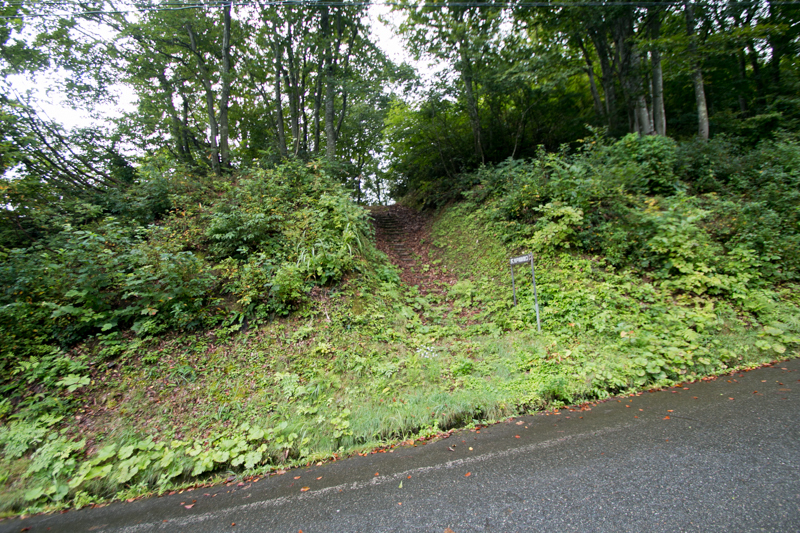 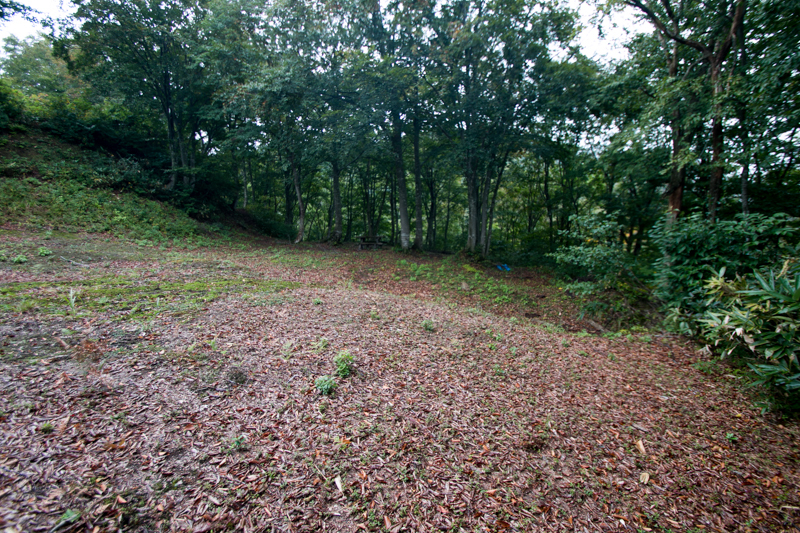 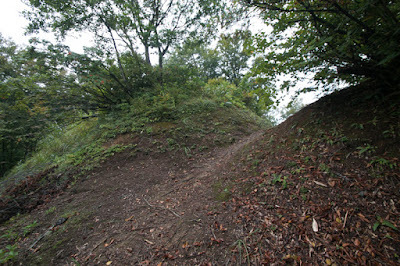 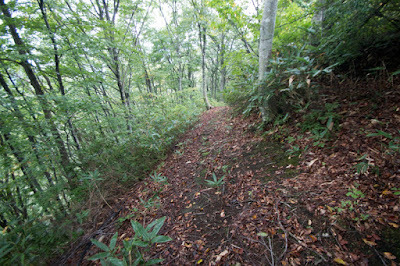 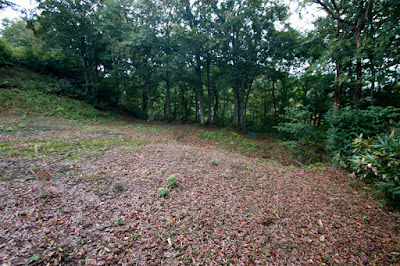 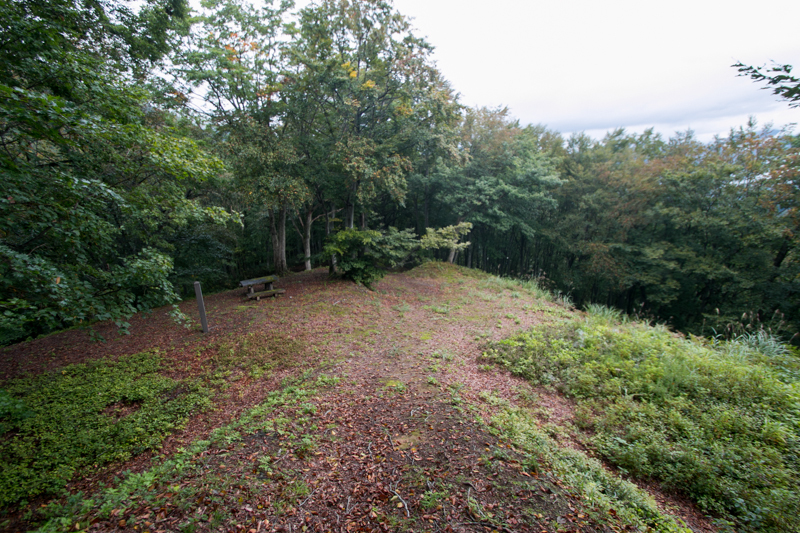 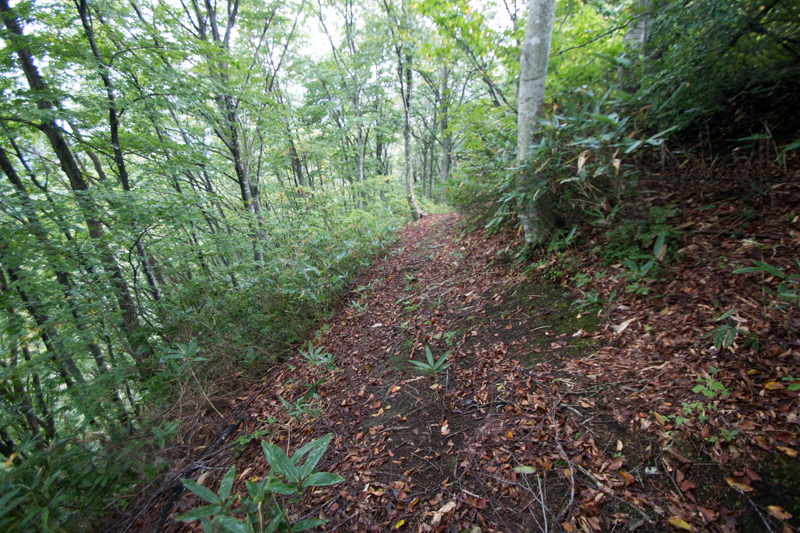 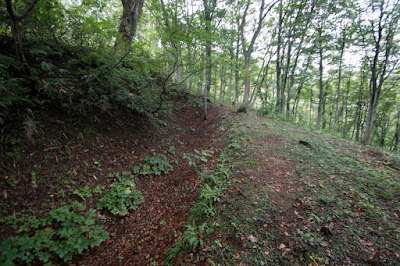 Castle site hill is a triangle shaped one and the bottom line toward northwest faces Mikuni-Kaido road ahead of 100 meter long gentle slope. If there are many soldiers the castle might be extended toward the road, but castle size is limited conforming the number of guardians, probably 200 or 300 soldiers. Of course this number of troop might be broken by overwhelming Hojo army in one time, but it was necessary to delay the enemy at least one day, show the moral of the force and gives damage even if only a little. Rough shape of Sakado castle like a compass. 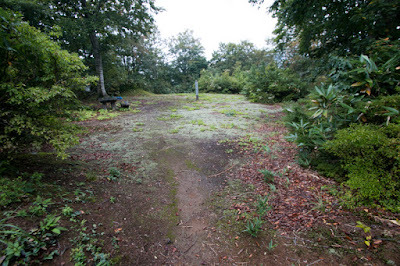 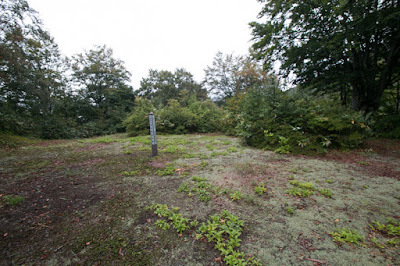 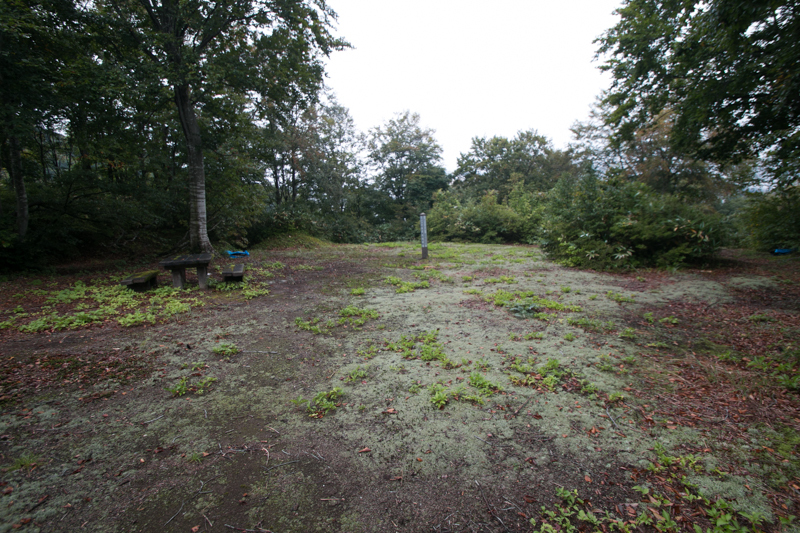 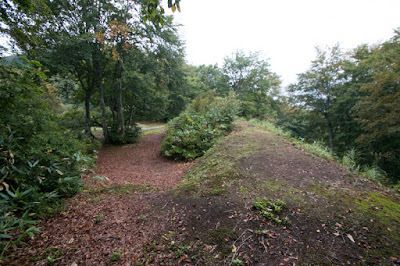 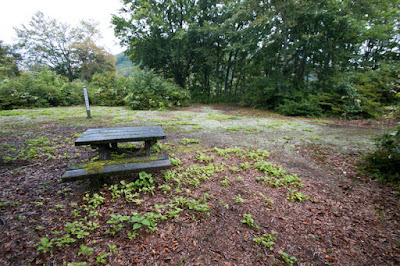 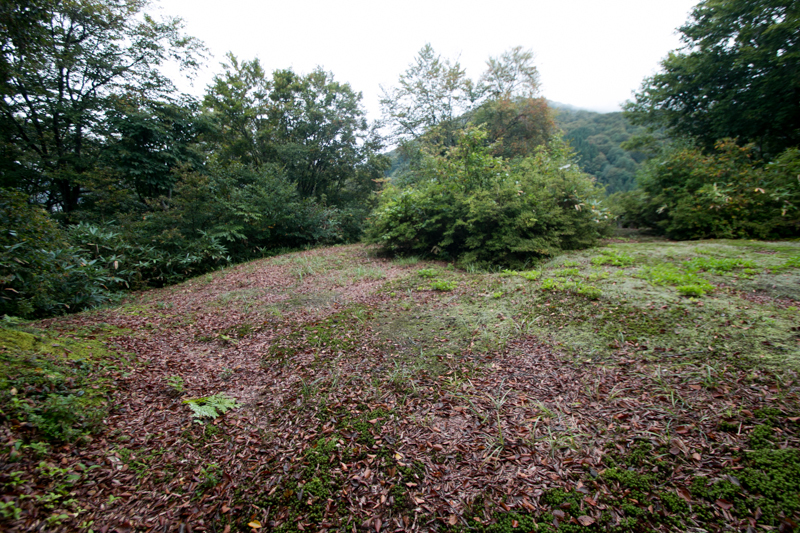 The central area of the castle is a square faced area of 40 meter long at the top of the hill. 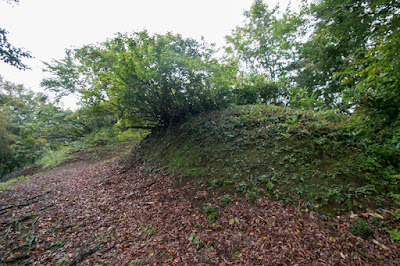 The back side of central area is directly connected to backside mountains with narrow ridge, thus this side is securely protected by wide dry moat, and guarding turret built over clay wall. 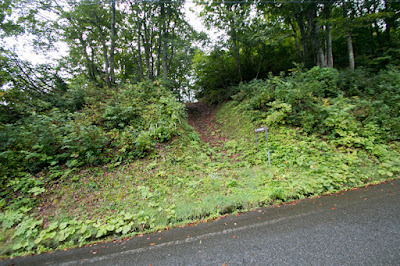 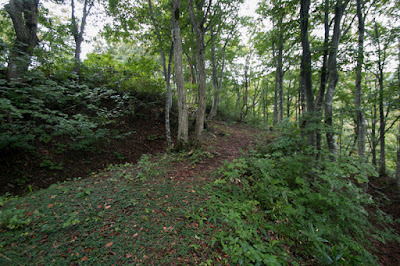 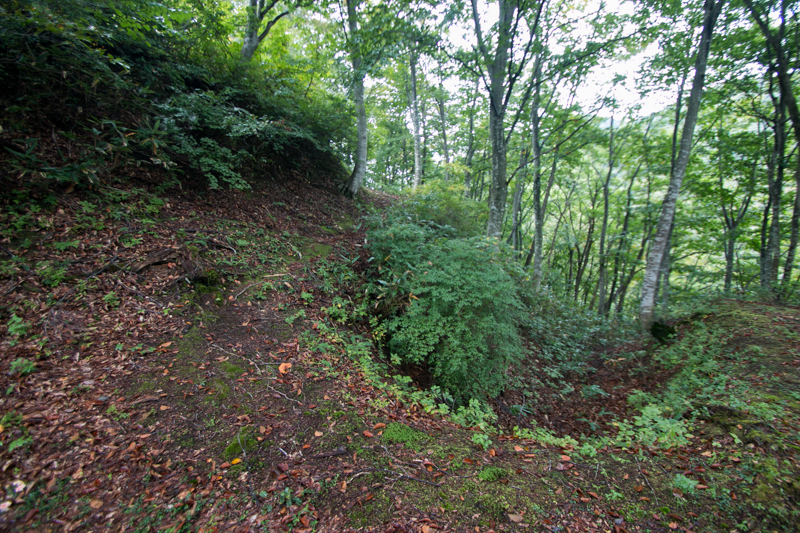 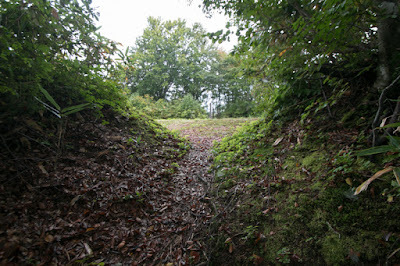 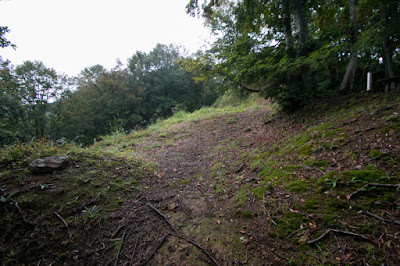 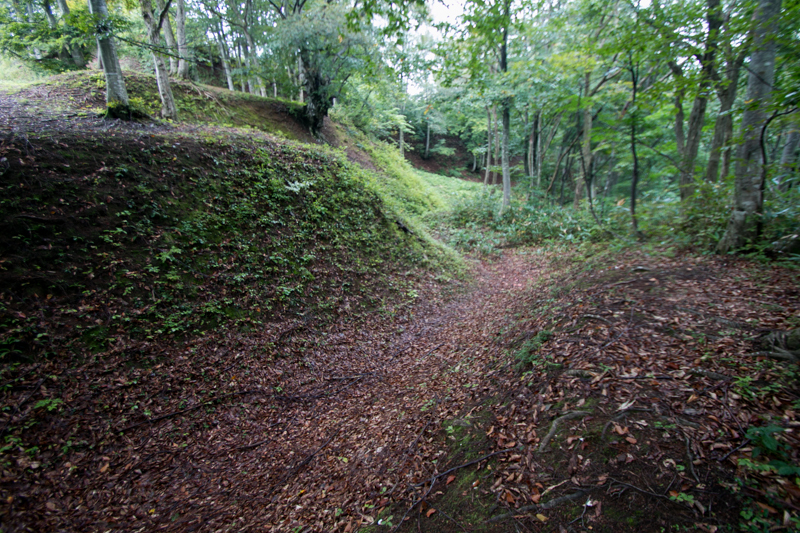 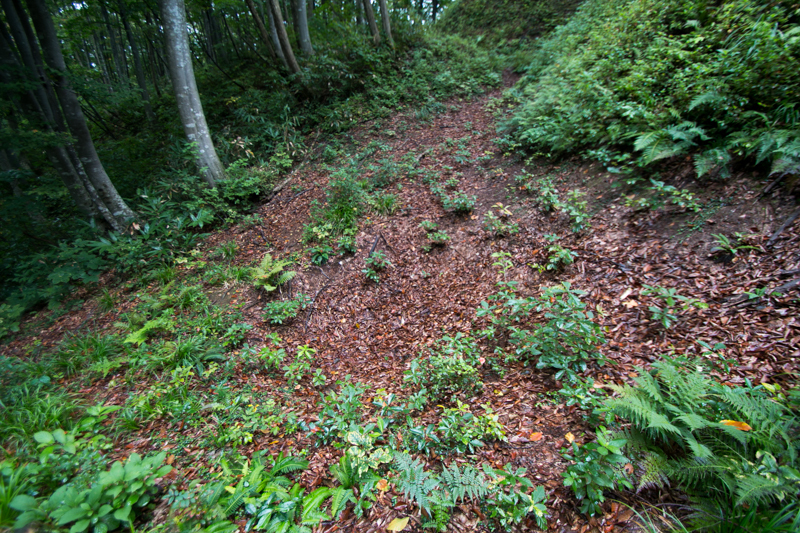 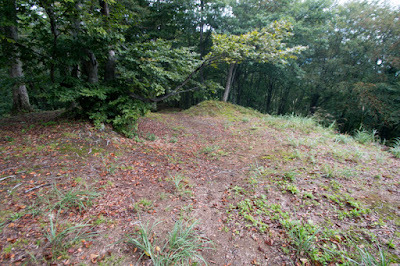 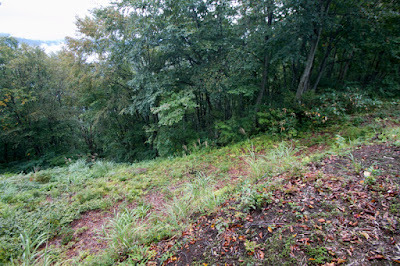 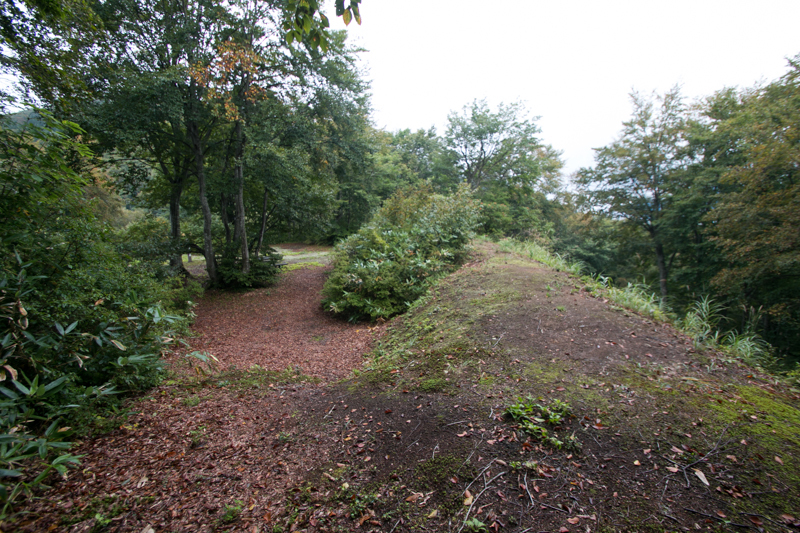 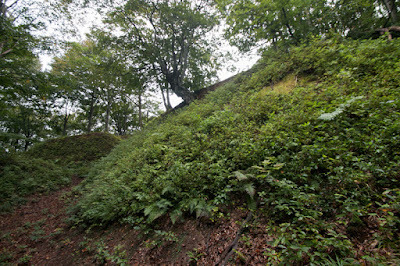 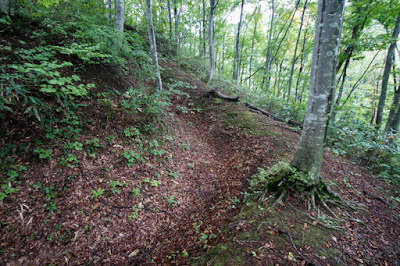 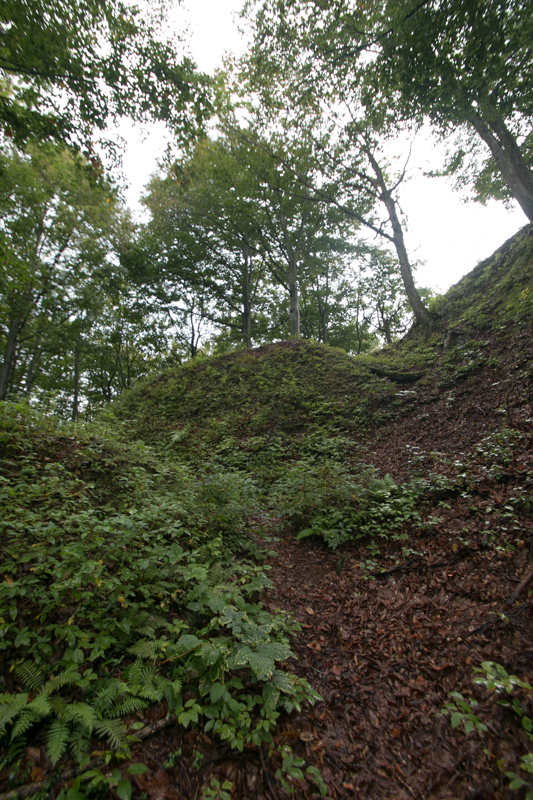 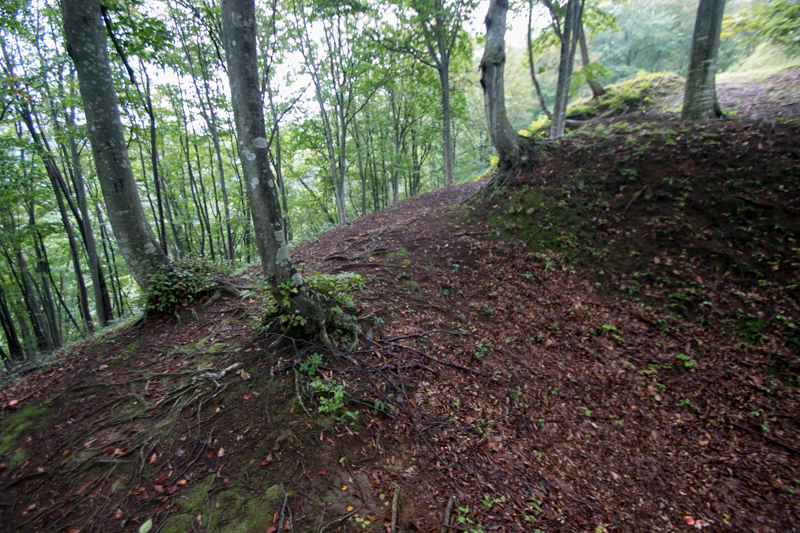 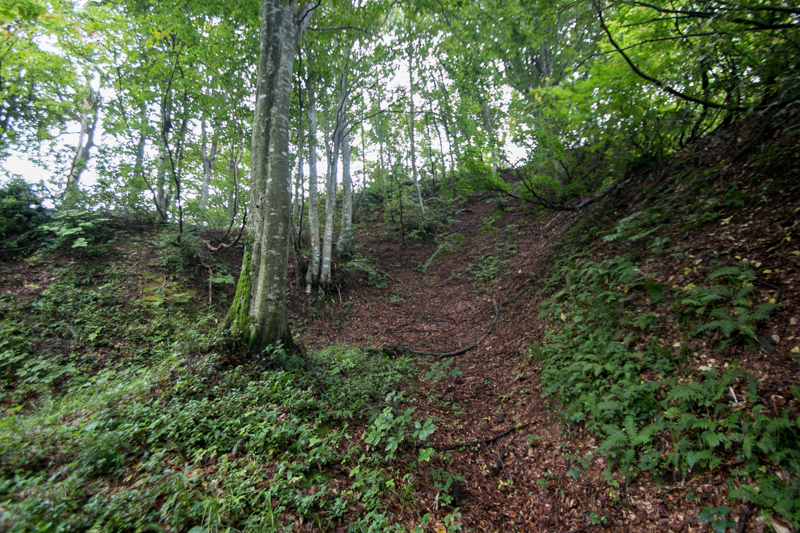 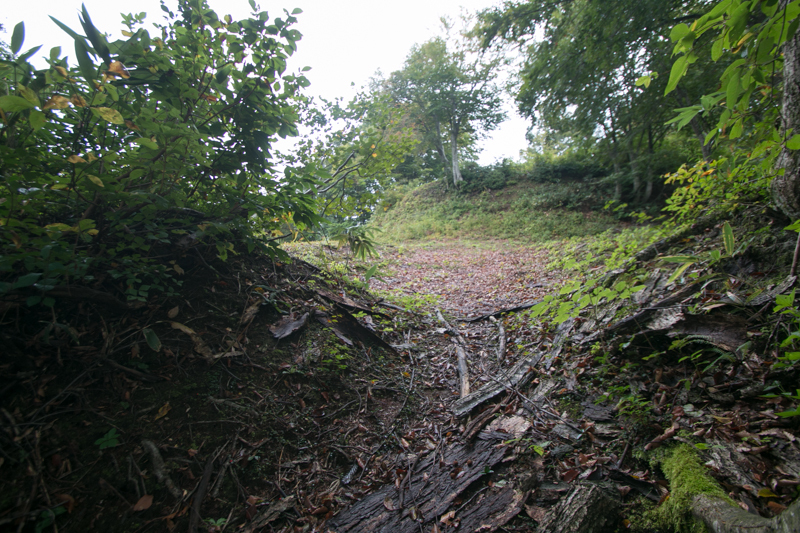 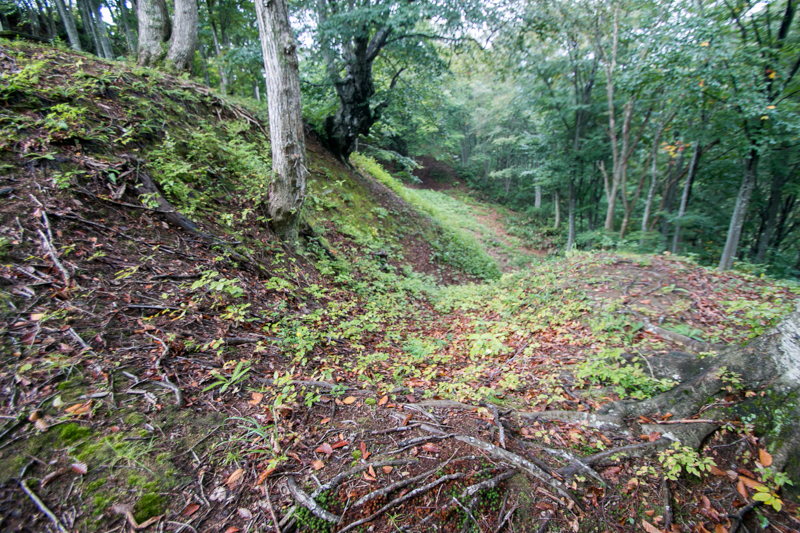 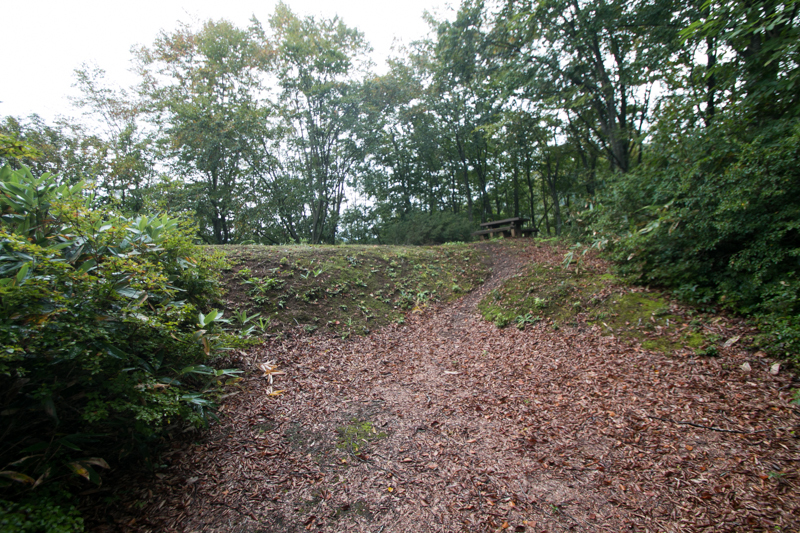 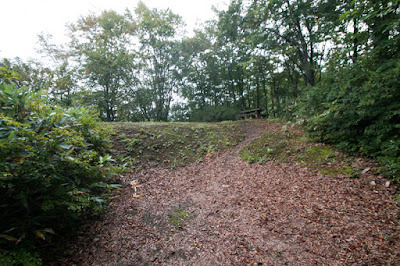 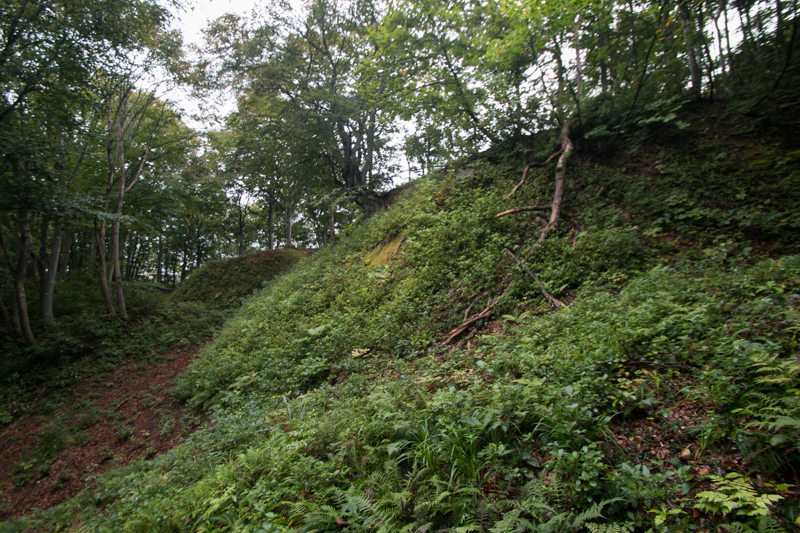 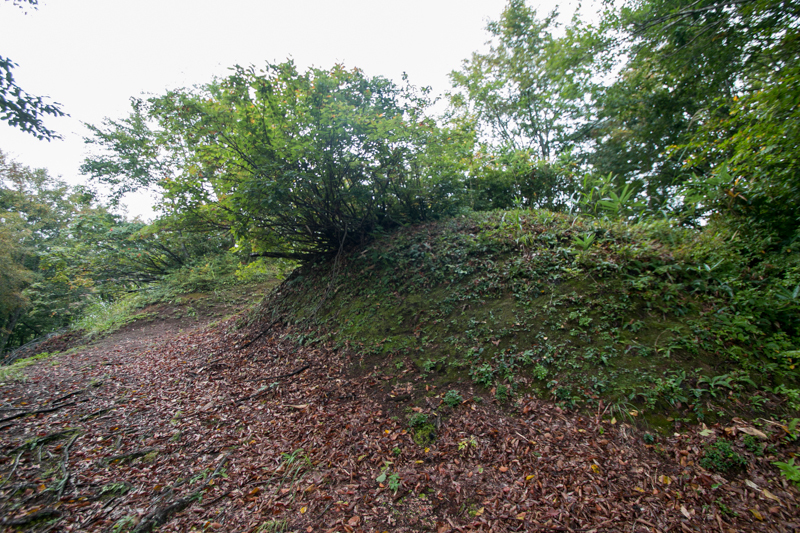 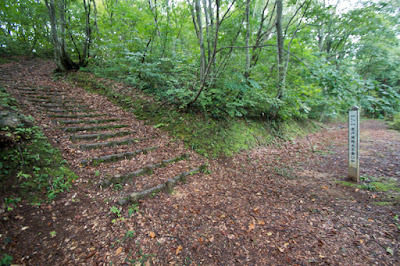 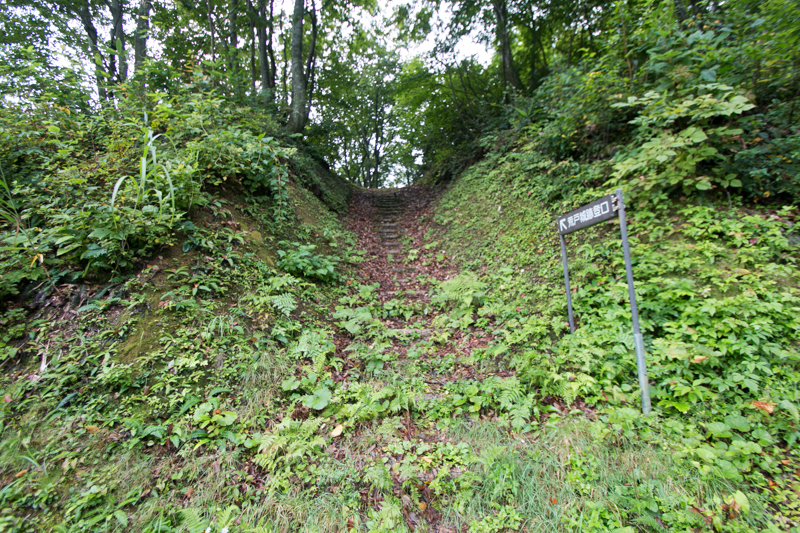 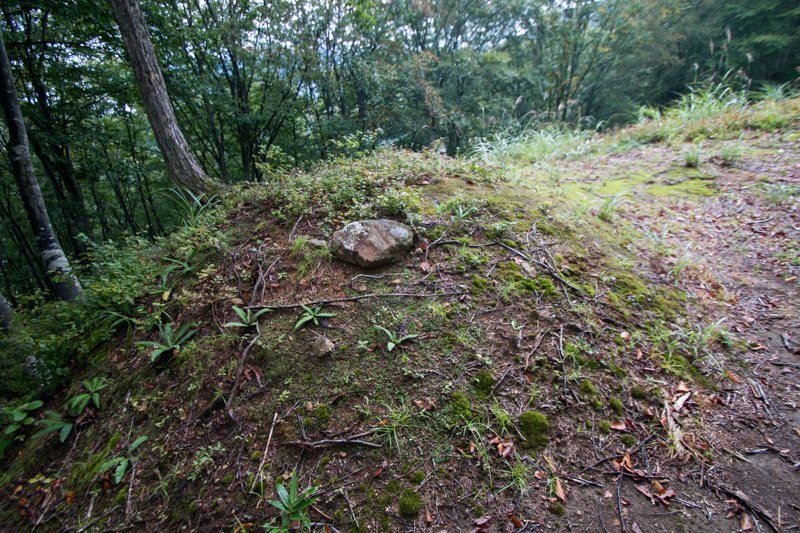 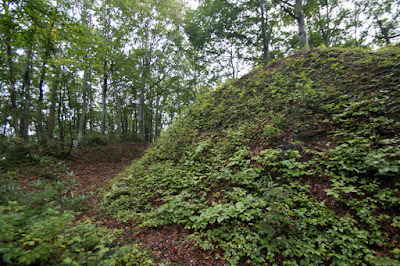 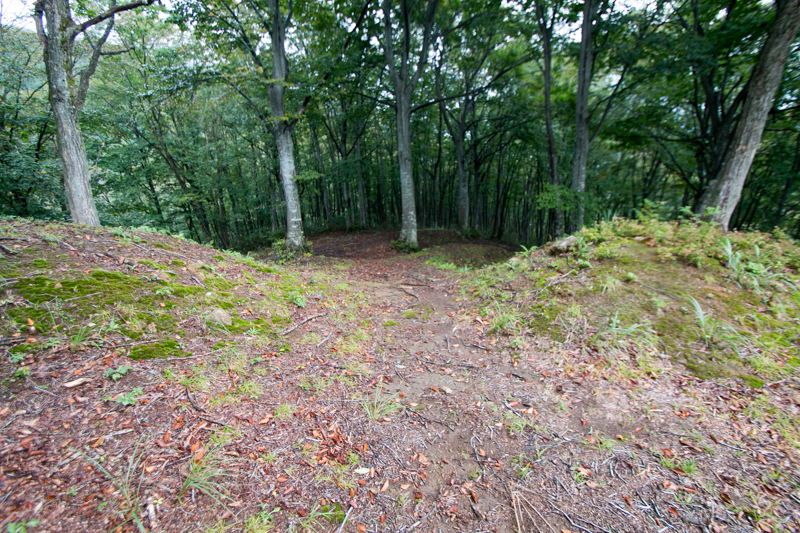 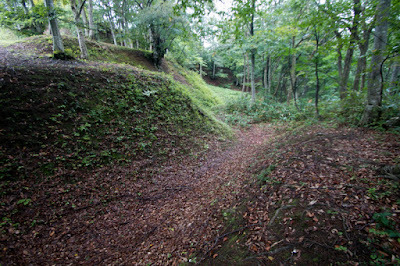 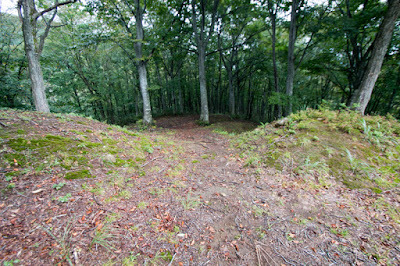 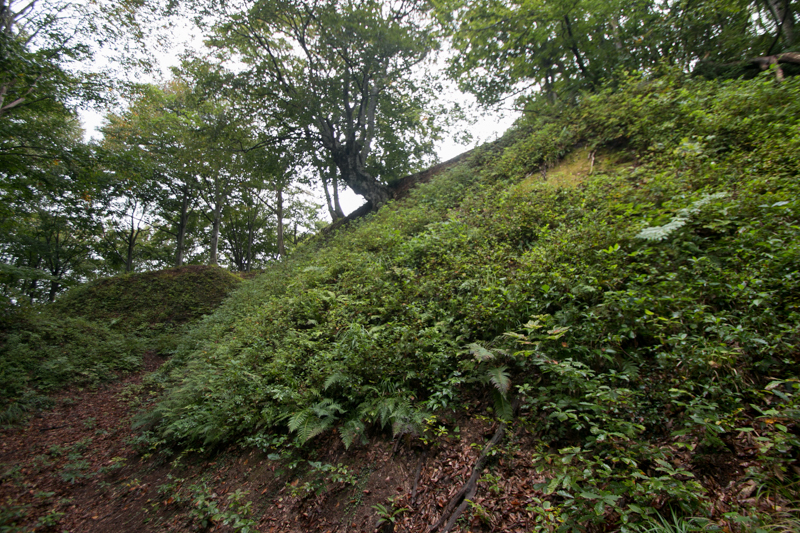 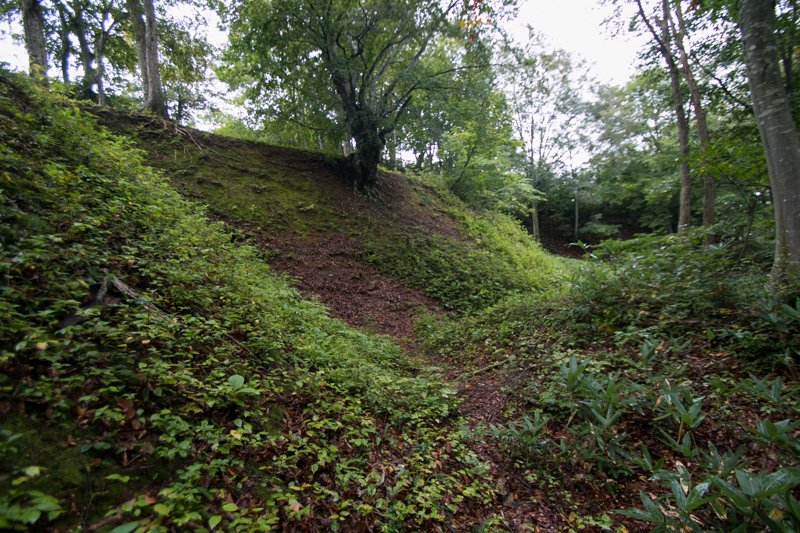 At the side slope of the castle, vertical dry moats are built to prevent the movement of enemy toward backside. 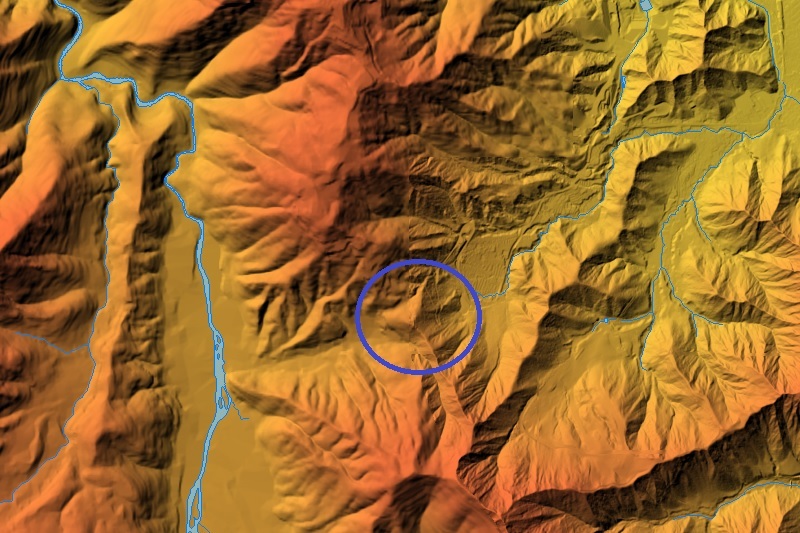 At the north and east of central area, there are two outer area called as secondary area and third area at the both side of narrow valley. 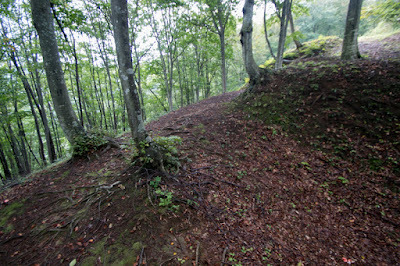 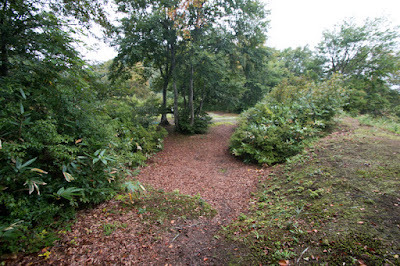 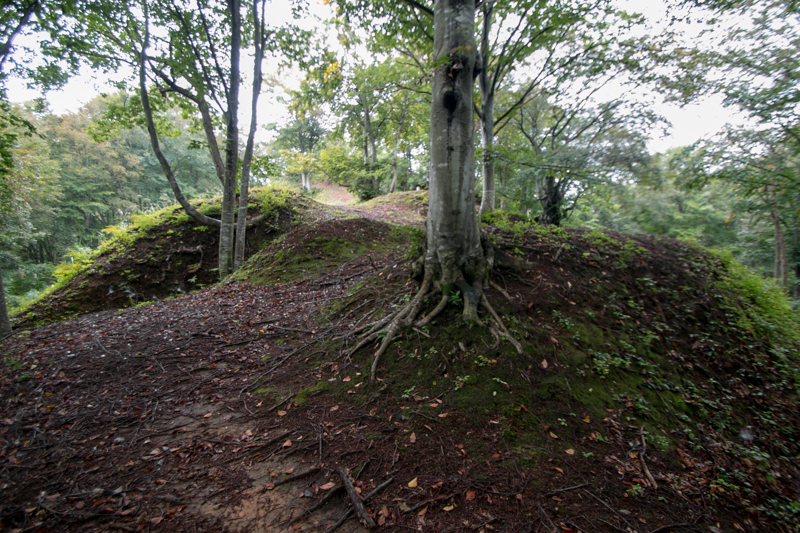 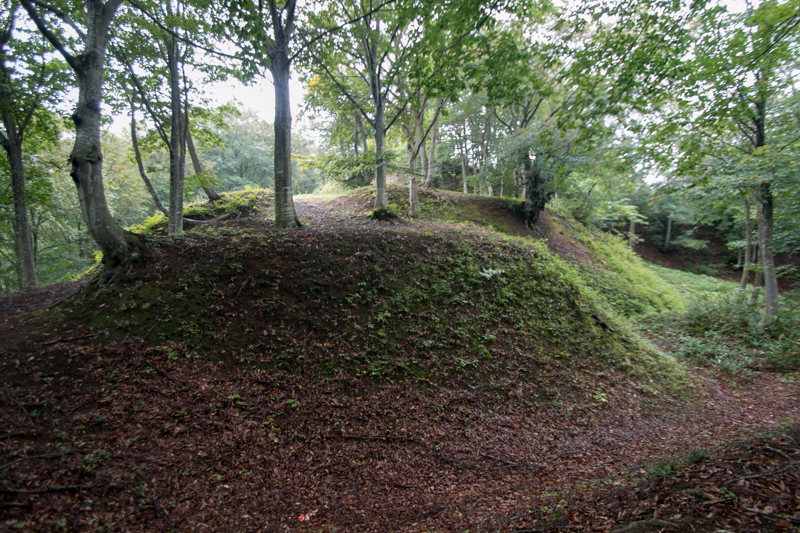 These two area are built as main combat front of the castle, and guarded by sheer clay wall and dry moat. 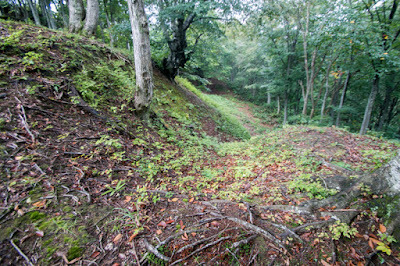 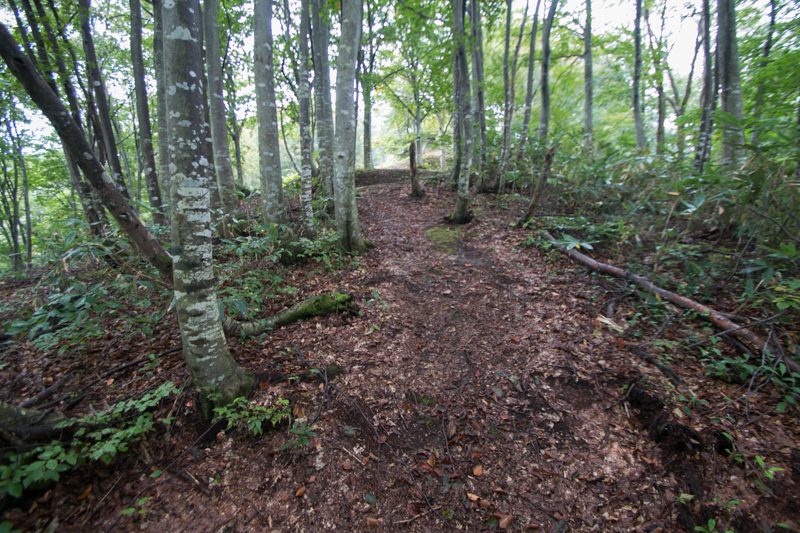 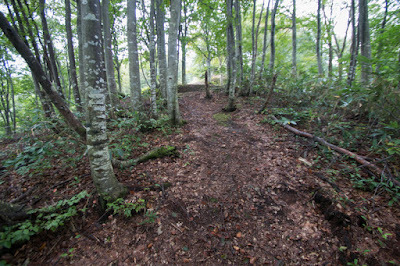 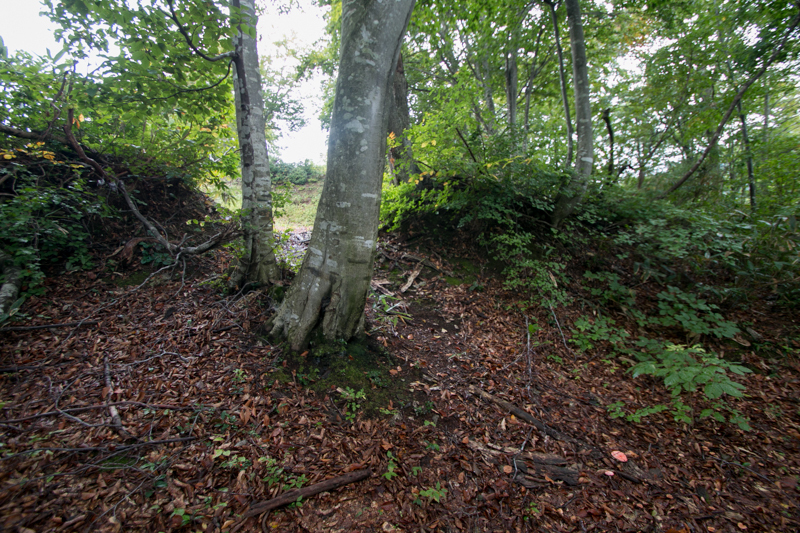 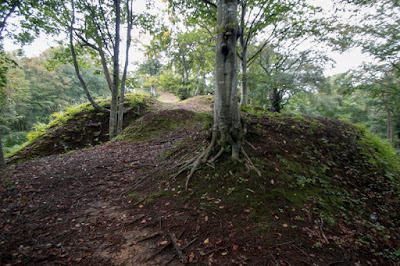 At the entrance of these two areas there are combined gates with small buffer area named as "Umadashi", which might be used as a starting point of counterattack and to support friendly force to retreat into castle. 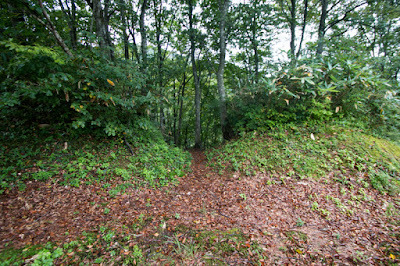 Narrow paths at these two gates are 90 degree folded and climbs the height gap, to prevent dominant enemy which break outer age rushes into the castle. As there was no sufficient supply of bullet and gunpowder, usage of matchlock gun is not expected, then guardians are expected to attack the enemy proceeds narrow path by long spear. If pressure of enemy becomes weak, a counter attack force starts from both buffer area, quickly attacks the enemy and retreats, to make time and give damage to enemy as far as possible. 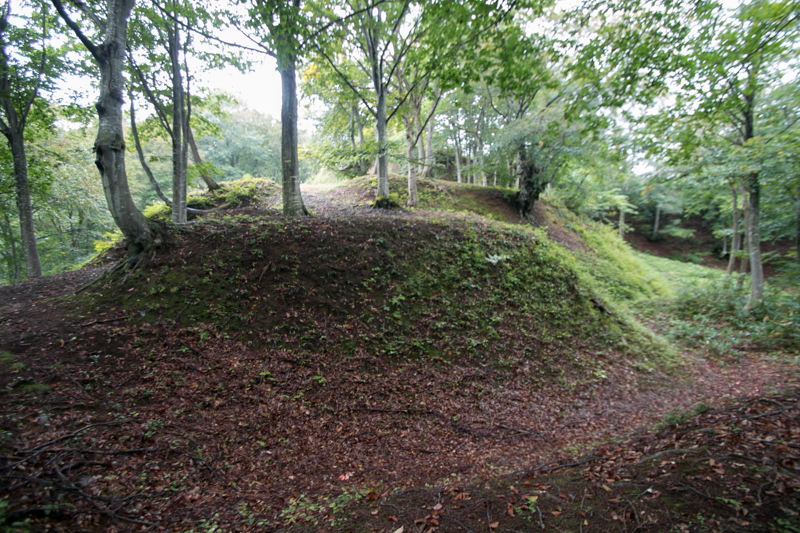 Arato castle is a small castle of 100 meter long triangle, but its purified and consistent plan is an advanced one. 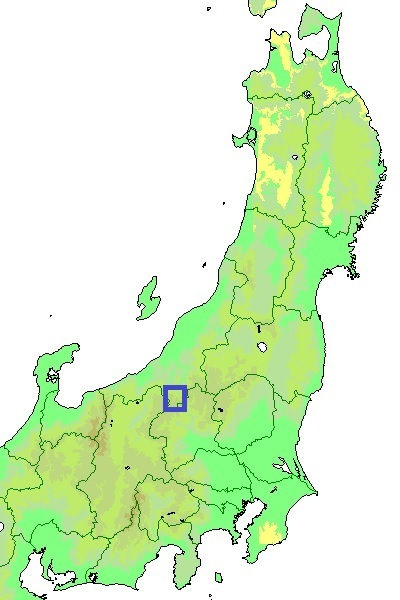 As expected, Hojo force assaulted Echigo province in the autumn of 1578. 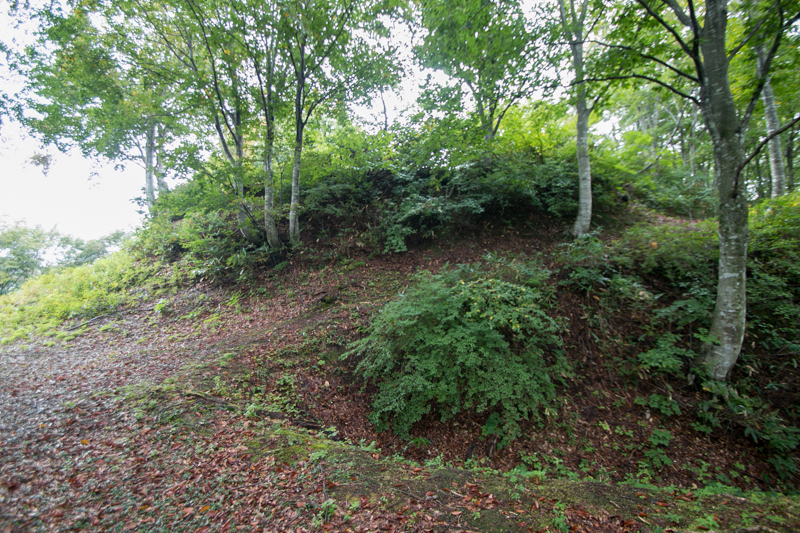 As the winter is approaching, Hojo army ignored this small castle and directly invaded into Uonuma plain, captured Kabasawa castle (Niigata prefecture), the born place of Kagekatsu, and siege Sakado castle. But Sakado castle is a secure castle located over sheer mountain, and supply line was unsecure became of remaining castles such as Arato castle. 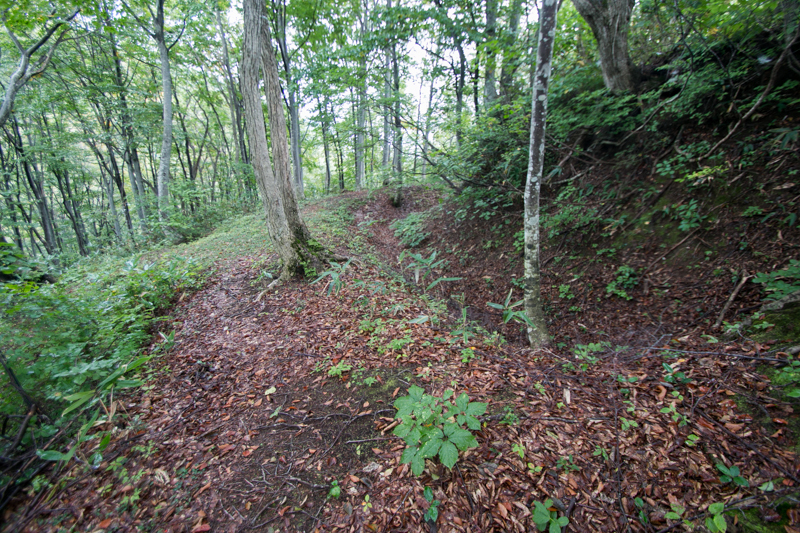 As a result, in winter Hojo army once retreated, and utilizing this chance Kagekatsu broke Kagetora and forced Kagetora to suicide at Samegao castle (Niigata prefecture) in March 1579. 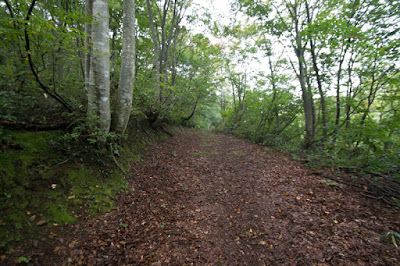 However, at the same time, Hojo clan sent large force again to rescue Kagetora. 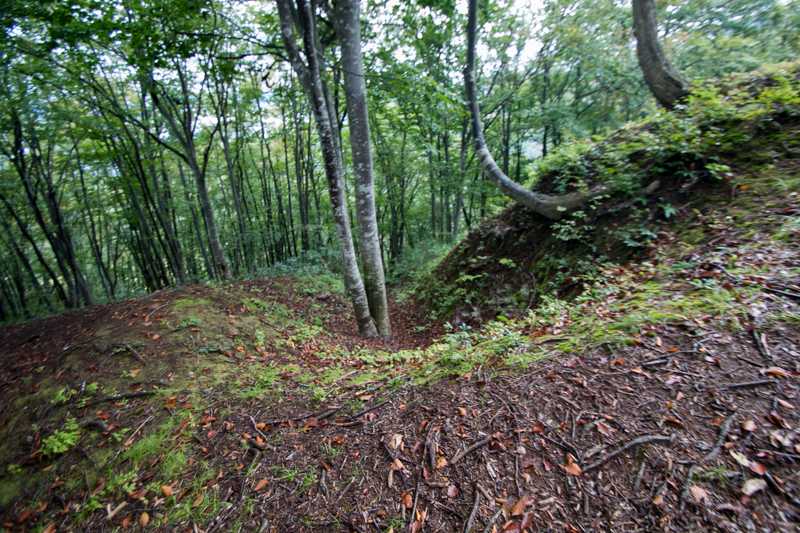 This time Hojo clan tried to thoroughly remove obstacles, and made fierce attack Arato castle. Being overwhelmed by dominant Hojo army, Arato castle fell in one day and the guardian general shared his fate with the castle. 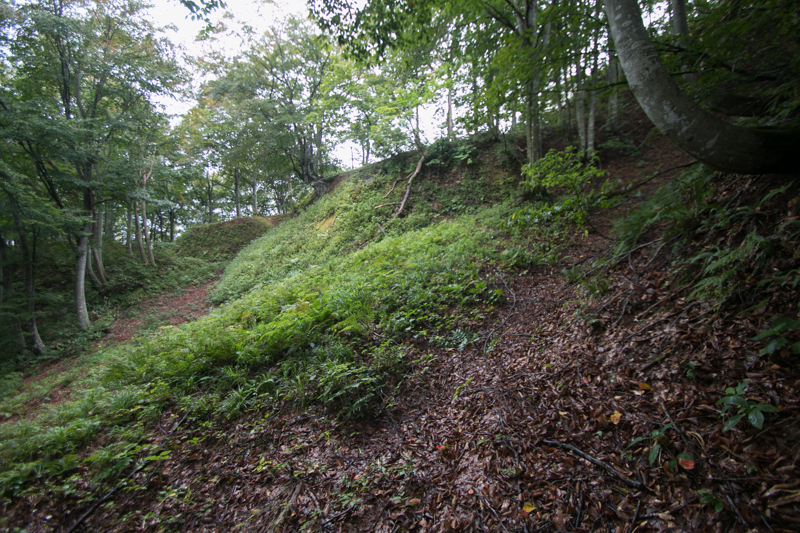 But utilizing this sacrifice of Arato castle, Kagekatsu side could secure Sakado castle again. Hojo army was not able to stay Echigo province long time, as supply problem still remains, and there was a fear of attack of Takeda clan which broke with Hojo clan and became an ally of Kagekatsu Hearing the death of Kagetora, Hojo clan finally gave up the intervention into this internal conflict and completely retreated from Echigo province soon. 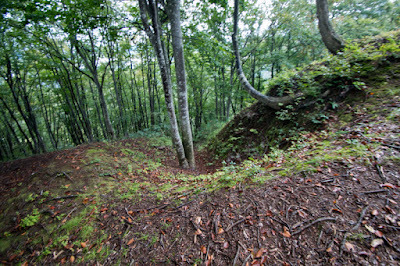 Arato castle might be abolished just after the cease of the battle. 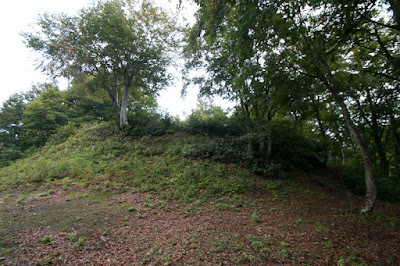 Today no building remains but clay structure of the castle is well kept over the hill. Looking at narrow and winding road climbing into core area, it clearly shows the builder intention to prevent dominant enemy by small forces at any means. 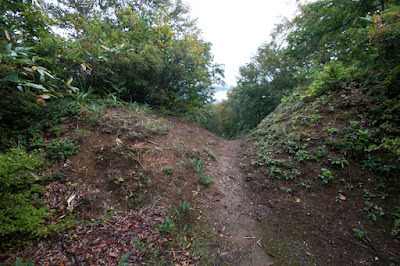 After twist and turns Uesugi clan could survive a feudal lord and continue till now, and the desperate sacrifice of guardians of Sakado castle for local lords were surely rewarded. 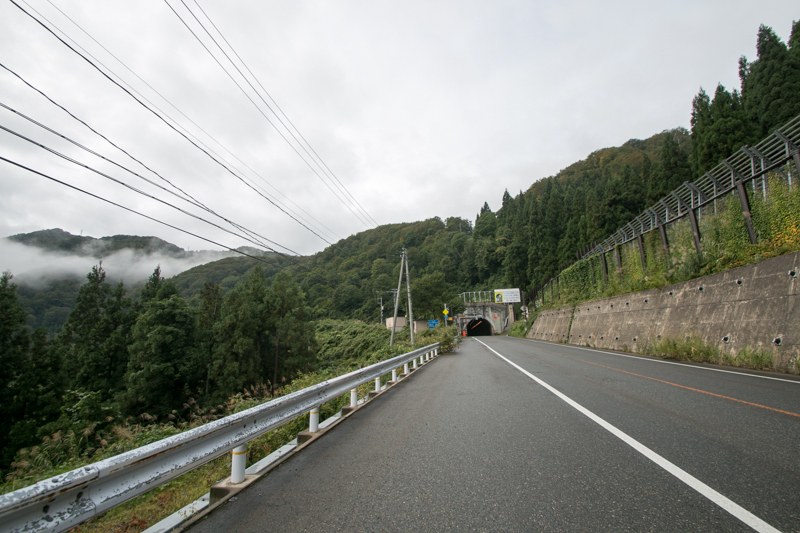 15 minutes drive from Kanetsu-Jidoshado Expressway Yuzawa interchange.